Those who follow the official ARMS Twitter account may have noticed that game announcer Biff has been on vacation for quite some time; the in-game and trailer personality has been documenting his travels through photos and video, howevver the latter was just a fuzzy clip due to a broken camera. Despite the lack of clear footage, Biff mentioned an encounter with a talented ARMS League fighter from overseas, equipped with the ability to change his or her body size and shape at will. Nintendo was able to clear up Biff’s footage and give fans a crystal look at the fighter in question with the latest trailer for ARMS. Making her Gamescom 2017 debut, “Lola Pop” will be the second DLC character, joining August’s “Max Brass”. 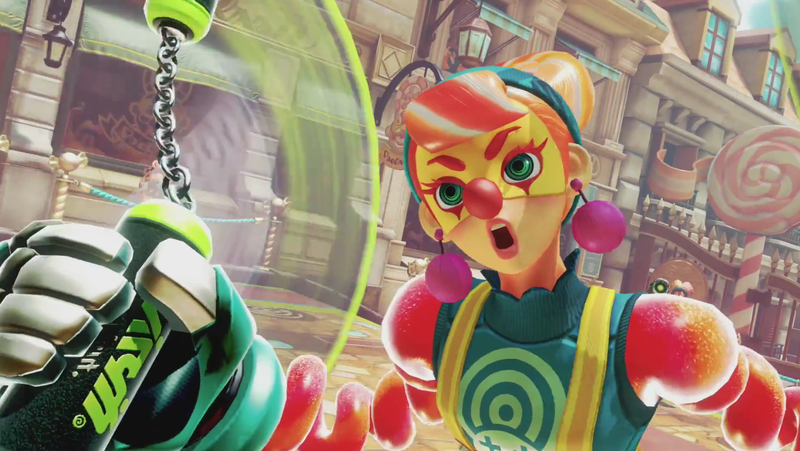 Lola Pop expands on the roster’s penchant for wild avant-garde character designs, as the upcoming fighter is a clown sporting candy hair with a lollipop bun, and gummy-based arms; the nunchaku-wielding circus entertainer is one of the few characters who can execute a double-jump, and can also temporarily inflate herself to nullify damage; aside from her default nunchaku Arms, Lola is seen sporting two new Arm weapons- projectile stamp-rockets that “stamp” the screen of an opponent, and a new projectile barrier that causes damage upon reflecting attacks. All of the action is set on Lola’s own stage- a candy-themed market square, complete with candy-cart vendors and street-side spectators; onlookers are showing their ARMS League pride by wearing costumes and accessories based on the current roster of fighters. Lola Pop, her stage and the new batch of Arms weapons will be available for free once the Version 3 update goes live; a release date has not been announced.